We are really proud to showcase some of the many happy guests and their smiles. All cases are done by our doctors. Book your consultation now to know about the different options that might be suitable for your smile! that rugged feel that goes with the silver fox look, these dark spaces may also collect food debris and plaque. Usually the result of bone loss, recession of the gum line, or movement of the teeth. Once the gum and bone recession is stable, it can be corrected with bonding of injecting moulding resin. This is a case of an gentleman who actually was getting a phonetic problem because of those triangles. The upper teeth were all made in one appointment of 90mins. We couldn't be happier with the result! It's never too late to have Straight Teeth! We offer a wide range of treatment including braces for kids and adults. 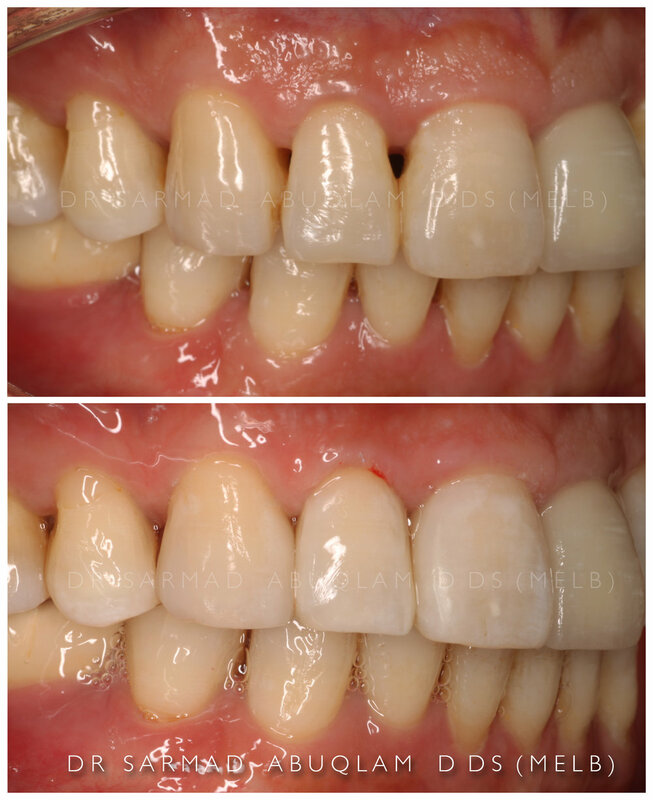 This case was completed in less than 6 months using our Ceramic Braces, the adults' favourite. We also offer Clear Aligners treatment which is virtually invisible. Clear aligners are the invisible way to straighten teeth without braces. Speak to your dentist at your next Check Up about it. Missing teeth can be replaced with either Implants or Bridges. Here's a close up photo of a bridge made for this gentleman. The teeth will look and feel just as your natural teeth. It's recommended to get replacements soon after you loose a tooth, otherwise the teeth either side of the space will start sinking into the space and causing more issues. A dental bridge may be your best option if the neighbouring teeth have large fillings and need crowns or caps in the future. Most clients' hygiene needs can be met by a full scale and polish. Deep-cleaning is also available, and can be done under local anaesthetic. It is sometimes needed if teeth and gums are left untreated, plaque can harden to form tartar which can spread below the gum line. This is a case from our practice showing removal of tartar and stain. The staining were causing our client an aesthetic concern. The teeth were scaled, cleaned and polished. Our dentists operate using a set of thorough tools and methods to ensure the healthiest of cleans. How natural can veneers look? The aim of such treatment is to restore the natural look and feel of teeth after years of wear and tear. They can also make slight subtle changes in the smile that go along way. This lovely lady had 4 veneers to replace old resin veneers from an accident and to straight and bring forward the “hidden” teeth on the sides. Smile! The only constant in happiness... Complete smile makeover can have a great impact on overall life! We enjoy being a part of your journey. We will be with you every step of the way. You are the author of your own story, we’re here to help. This lovely lady wanted a smile to suit her age and personality. We decided to do Take-home whitening followed by 4 natural veneers transformed her smile in a subtle way to make her extremely happy! Smiles all around at Future Health! Composite bonding is a cosmetic technique where Composite (White Resin Dental Material) is shaped to give the appearance of a beautiful straight smile. Often used as a solution like this case for chipped teeth. It can be matched to the colour of your teeth to make it so seamless and natural. Total treatment time for this case was 45mins. Everyone wants whiter teeth, there are so many options for it out there that it makes your head hurts. The verdict is to have them done safely and efficiently with your dentist. Ask us about whitening offers at your next check up as we run different ones throughout the year. This lovely client had hers done with us. Total treatment time 60mins. This lovely client had a big aesthetic concern that has been addressed with Ceramic layered Implant Bridges. We offer many aesthetic replacement options and each will be tailored to your individual case. Our aim is to get you as ecstatic about your smile as you can ever be! Follow Future Health Medical and Dental Centre on Instagram for the newest smile transformations. 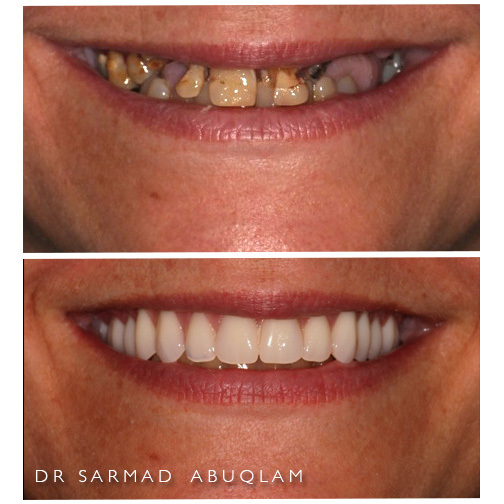 We are proud to show real cases of the most amazing smiles that we have created for our guests at the practice.